Update 2/15/17: Added 8 RSR reviews. Update 2/3/17: Noted 73% of SF/F Locus List stories are in RSR's YTD page. Here is the annotated 2016 Locus Recommended Reading List for short fiction. RSR reviewed 94 out of the 124 stories in the Locus list (76%). Of the 30 not reviewed by RSR, half were stories from horror magazines and horror anthologies. The other half were from other science fiction & fantasy sources, some of which might be reviewed by RSR as time permits. 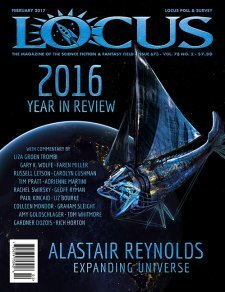 Moreover, 80 of the 109 science fiction & fantasy stories in the Locus list (73%) are in RSR's Year-To-Date page. That means one can follow the Year-To-Date page over the course of the year and read stories that are likely to make it to the Locus list. There’s also the Annotated 2016 Nebula Award Nominees.